This place had some hype and sort of the talk of the town… two different little birdies told us about this place and it did live up to the hype. There was a line out the door, but, it went pretty fast, maybe a 30 minute wait. Our friend, who has family in Singapore gave us the low down on what to order. It was so awesome to see them making the roti dishes while we stood and waited… it made us all the hungrier. Once we sat down, we ordered too much and kept ordering…. roti canai, roti kaya, kari kambing, rojak, nasi goreng, and ayam goreng. We ate so much it hurt. Mamak, 15 Goulburn St., Sydney. 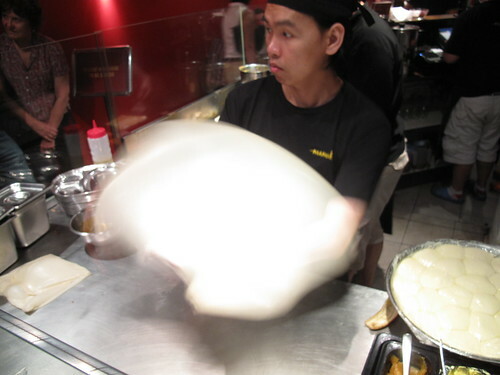 Making Roti at Manak, Sydney from Poketo on Vimeo.